Poet, publisher, singer, sailor, gardener, Anne French is now living again in Wellington where she was born in 1956. She was educated at Ngaio Primary School, Wellington Girls' College and Victoria University of Wellington from which she took an MA in 1980. She has trained as a teacher and was at one time a Teaching Assistant in the English Department at Victoria University of Wellington. Anne has had a distinguished career in New Zealand publishing. She has been the editor (1981), Managing Editor (1982), then Publisher (1989) at Oxford University Press New Zealand, Publisher at Te Papa Press, where she was also a concept developer on Te Papa’s Time Warp, and the Managing Editor of New Zealand Strategic Management (New Zealand’s only refereed business journal). She is now the Strategic Adviser, Policy, Strategy and Evaluation, at the Foundation for Research and Technology. 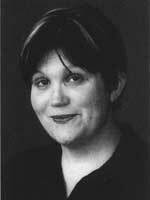 Anne’s most recent collection of poems, Boys’ Night Out, was published in 1998 by Auckland University Press and was a finalist in the 1999 Montana New Zealand Book Awards. Her collection All Cretans Are Liars (1987) won the NZ Book Award for Poetry and the PEN Award for First Book of Poetry in 1988. Other publications include: The Male as Evader (1988), Cabin Fever (1990) and Seven Days on Mykonos (1993). Anne has won a number of other awards and scholarships including the PEN Young Writers Award (1972, 1973) and grants from the literary grants fund (1987, 1990). She was the inaugural writer in residence at Massey University (1993). A well-known and respected reviewer and literary critic, Anne has been a regional judge for the Commonwealth Writers’ Prize. She has served on the Children’s Literature Panel of the New Zealand Arts Council and, more recently as an assessor in the CNZ Literature Programme (ie, not just children’s literature). In her ‘spare time’, Anne sings in Cantoris, a Wellington choir dedicated to early music, manages the Wellington Junior Symphony Orchestra, runs, gardens and tries to go sailing occasionally although she is an ‘Auckland sailor’, easily rattled by Cook Strait. She is the joint owner of a yacht called Saracen, which was the first Spencer 37 (a piece of yachting history which, she says, will bore all but the old salts, who’ll remember it well). On top of all this, Anne recently managed to find the time to finish an opera libretto called ‘The Long Lunch’, which is being set by Wellington composer Michael Vinten. She has also been secretary of PEN (NZ), a member of the Auckland Bach Cantata Society, and a member of the Book Publishers Association. They don't read, of course. from the cd Seeing Voices, Auckland UP, 1997.